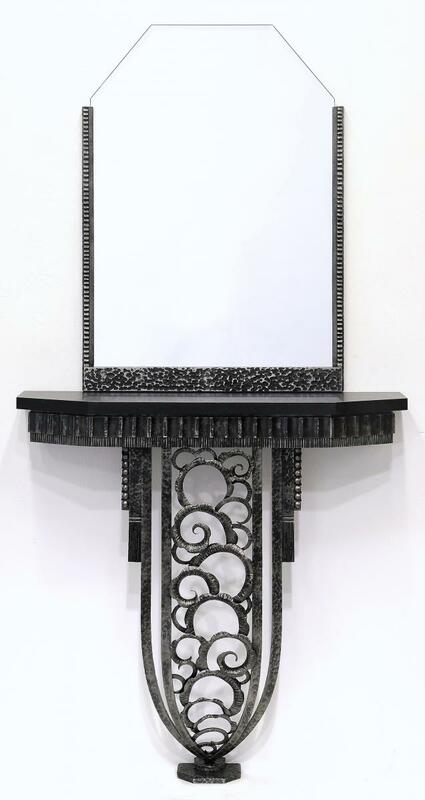 Forged art deco vanity console. Based on the design of Edgar Brandt. NIce work. I am in the opposite direction of Las Vegas than you are, Moapa Valley. Thanks BIGGUNDOCTOR! I lived in Pahrump for the last 6 years but unfortunately I have to move on. I am planing to move to Southern Arizona. Hopefully next year. I've seen that you're a tool maker. What kind of tools are you making? I was the tool maker for a CNC screw machine shop in Utah; custom saw arbors, gang saws, set ups to repair other people's goofs, etc.. I am back to being a maintenance mechanic , and back in Las Vegas for now.....looking to start another business of my own. Why the move to Arizona ? Awesome, did you work in the Saint George area? I am leaving because I had to give up on my land and dreams thanks to the local power/water wars. I bought 5 acres to build a new shop and house on and a order came out from the state engineer that forbids the drilling of new domestic wells. The closest utility line for water is about 8 miles away from my property. I saved up for 6 years for this land, so you can imagine how upset we were when the order came out ( and d they did it sneakily, so nobody really knew this was coming). I love the desert and Arizona has one of the most forward thinking laws when it come to water resources, so it was an obvious choice. What kind of business are you planning to start? I will continue this in the messenger feature.